Boosteroid will be kicking off a three-stage ICO this month to help drive its disruptive cloud platform. Having already successfully sold two million BTR tokens ahead of schedule at the pre-ICO, the international project Boosteroid is slated to launch its official ICO on October 23, 2017. One factor that sets Boosteroid apart from other startups is its decision to initiate the project regardless of its initial coin offering (ICO) results. As a show of confidence, the group’s requisite computing facilities are already being built. 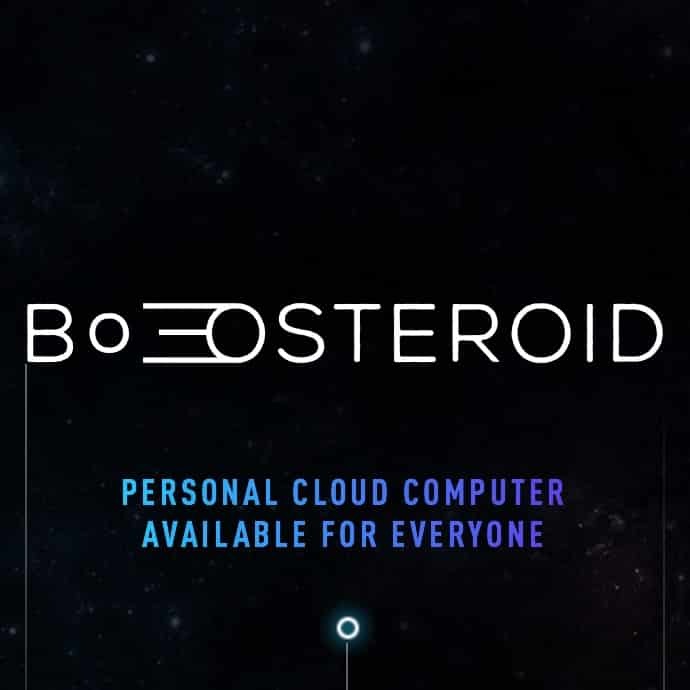 Boosteroid is a cloud services platform that provides convenient access to computing power, storage, software products, and other functionality. The project will allow individuals to abandon expensive personal computers in favor of a powerful remote service with a user-friendly interface and a simple management. A computer is able to carry out a variety of tasks in the cloud – from working with texts to analyzing DNA. Today the prices of cloud computing rent offered by market leaders — Amazon WS, Microsoft Azure, Google Cloud — are very high, and as such this service is still largely the privilege of the elite. This situation spurred experts to create Boosteroid. Not only do users have pay a lot for computing power rent offered by market leaders, but these individuals also face difficulties when trying to take rent out this space. It is very challenging even for advanced users to go through any semblance of a rental procedure that includes complex settings and requires a lot of time. In a bid to help expand computing facilities and make price of computing power rent competitive and available for everyone, the team has decided to hold the ICO. Boosteroid has opted to forge ahead regardless of its ICO results and is doing so in a three-stage offering. According to Boosteroid Founder Ivan Shvaichenko, this is because the team doesn’t need the total amount of investments at once. Investors interested in the ICO are invited to read the group’s whitepaper. “We will use the funds raised after the first ICO stage to set up electricity connection, get the premises ready to the setup and launch of computing facilities, purchase of the first facilities and further software development to provide convenient access to them. Funds raised after the second ICO stage will be used for equipment purchase and setup to start the operation of our computing facilities. Funds raised after the third stage will be used to further expand computing power of our project,” noted Mr. Shvaichenko. We start accepting pre-orders for the purchase of BTR tokens on October 16, 2017. The first stage will start on October 23, 2017 at 9:00 (CET), ending November 6, 2017 at 21:00 (CET). The ICO can be completed ahead of schedule if the needed investments are raised. The initial price of 1 Boosteroid token (BTR) is $0.48, with a final price of $0,58. Investors will be able to exchange ETH, BTC, BCH, and LTC for a total of 100 million BTR tokens. November 27 to December 11, 2017 – the total number of BTR tokens to be offered will be 300 million. The starting price of 1 BTR token during this period is $1.08, with the final price pegged at $1.38. January, 15 to February 15, 2018 – the total number of BTR tokens that will be offered twill total 400 million. As such, the starting price of 1 BTR token will be $1.88, while the final price will swell to $2.78. Investors interested in the Boosteroid project will be able to trade BTR tokens at a much higher rate. By extension, BTR tokens will become available on the main cryptocurrency exchanges after the second ICO stage. The eventual goal will be to dramatically reduce the cost of cloud computing. Currently the minimum price for one-hour of computing power rent offered by Amazon Web Services, Microsoft Azure, and Google Cloud is $6.5 to $10.5. Boosteroid will be the same service only for 1 BTR. Accordingly, BTR token rates will grow and are targeting a growth to $6.0. Do you really want to move such big sharks like Amazon, Google? If the price of your cloud computer “boosteroid” is low, then you will have a successful ICO. Affects the interest of investors, for several hours 2 000 000 tokens – this is a super start for beginners! This service is really relevant today. I tried to register for Amazon and Microsoft Azure, but I did not succeed! Really user-friendly interface, everything is easy and without unnecessary problems. The project has not been implemented yet and it’s too early to talk about it. But no one argues that if they offer the same, but at a reduced price – they are waiting for a good future. Well, buy these tokens, and then what? Why such confidence that they will grow? Such an assessment can be given to any project, if not to understand it to the end. Boosteroid is able to carry out a variety of tasks in the “cloud” – from working with texts to analyzing DNA. But if you don’t need the power, you can re-sell their output over time. The demand for rent of cloud computing is constantly growing, and their price is much lower than that of Amazon and others. The more that colloquial tokens are limited! There are many factors for growth, read the white paper, everything is clear. What is the minimum amount of BTR tokens I can buy? As I know there is no set minimum. The project already has investors who are ready to implement it regardless of the amount of investments collected at ICO. How to take part in the ICO and buy Boosteroid tokens? Why three stages of ISO? Because they do not need all the money at the same time! Means from the first stage they have to prepare, from the second to purchase equipment, and from the third to further capacity building. I myself do not need such power but i can re-sell their output over time. At the beginning of 2017, the industry of cryptocurrency was already sufficiently developed, there were a lot of such people. Now they share their success stories, and many have a desire to invest in the cryptocurrency. But the situation with cryptocurrencies at this stage has features that make it possible to assert that now it is not too late to invest in them. And we should not regret the opportunities that were not used before, but use existing ones. Do you think this theme is now really popular? Who will buy them, even for 1 BTR? That’s it, those who do not have time to understand the project, just start to spit out the negative and say that everything ICO is a complete deception and the whole life is full of horror. This behavior of people is caused by their standard of living and knowledge. I understand, maybe someone had a negative experience or something else. But if this continues, then you can generally forget about progress and live in a hole constantly something of fear. Investing in crypto currency is a good way to generate revenue if your savings are not very significant. Even if the rate drops dramatically, you will not lose much, but with its increase, the profit will be very appreciable. I don’t understand why those who do not have time to understand the project, just start to spit out the negative and say that everything ICO is a complete deception and the whole life is full of horror. This behavior is due to their quality of life and knowledge. Most do not even understand the project, they start to throw out a lot of negativity. can someone had a negative experience or something else. Ok, if this project already has its own investors and they will continue to develop the project regardless of the results of ICO, why do they need ICO at that time? Maybe I don’t understand something? well, maybe these three stages will somehow help them. Did you hear that the guys are launching a demo version? Personally, this already inspires confidence in me. I generally learned about the project recently, as usual, all at the last moment! But in the second stage I already plan to join the ICO and, if possible, resell the tokens after a while. Yes, it shows that they keep promises that have been given to investors. According to the founder, despite the fact that the demo service has limited functionality, we can still play games that require high computer performance, process video or create 3D graphics even on the lowest-performing device. I am pleased with this approach to work, if all start-ups so responsibly approached the matter, much more people would invest in ICO and the project creators themselves would receive more profit for the implementation of the plan.